David Keenan, For The Good Times. After a career as a music writer spanning more than 20 years, David Keenan released his first novel This Is Memorial Device in 2017, a novel about a fictional music scene set in Airdrie, Scotland in 1983, during the middle of the post-punk boom. Psychedelic, hilarious and genuinely affecting, it achieved much critical acclaim, and won the inaugural London Magazine & Collyer Bristow Prize for innovative debut fiction. With his latest novel For The Good Times due to be released later this week—a dark comedy set in the Ardoyne district of Belfast during the 1970s—we caught up with David to talk The Pastels, The IRA, and the surrealism of Mexico. I just finished reading For The Good Times, and thought it was brilliant. As somebody who has a long history as a music writer, in a sense the subject matter of This Is Memorial Device was a logical step when writing your first novel, so I was quite interested to see where you would go next. For your second novel, what led you to write about The Troubles of the 1970s? It’s funny because when I was younger I always wanted to be a novelist. I always thought that one day I would get around to writing books, and there were two books that I knew I really wanted to write: one about Airdrie because I wanted to take the idea of being from a small town being a miserable experience and to turn it on its head, as I had quite a magical time there — and the other was Belfast during The Troubles. My Dad was an Irish Catholic who came from the Ardoyne, and he left the Ardoyne just as The Troubles were beginning, but most of his family stayed. They used to come and visit us quite a lot when I was younger to get away from The Troubles, but obviously we would speak to them on the phone as well, so we were getting regular reports about what was happening in Belfast and elsewhere. One thing that attracts me, and that I think both books have in common, is that I’m interested in writing about places where different rules apply, places where reality itself feels as though it might be up for grabs, and certainly in a small town during the post-punk years in the early 80s, that was the feeling. And certainly with Belfast during The Troubles — and Belfast now still, because I think that Belfast is a magical and dangerous place, but a magical place all the same — it felt that in Belfast, reality was also up for grabs, depending on who was telling the story, and who owned the story. My Dad and his brothers were illiterate — they didn’t go to school and they couldn’t read or write. But, when they would send you a birthday card or a Christmas card, they would try to guess how long each word was, how grammar functioned, and they would do things like have a comma after every word, have every word underlined, and each word spelled in really weird ways, so it began to read like poetry. And when you would meet these guys, they had an incredible faith in language and the word for people that were illiterate, because one of the most important things for all these guys was to look good, to look sharp, but they liked to have the best patter, to tell the best jokes, and to tell the story in the funniest manner, and the language was incredible. So if I was to sit around listening to these guys who looked so suave and who were into Perry Como, they were illiterate but had this incredible faith in language, and for the power to tell your own story. I wanted to capture that. That’s one of the things that For The Good Times is about is, it’s not a book about The Troubles, or a book about the IRA, that’s just the backdrop. Really I wanted to explore things that seemed heightened in Belfast, that seemed heightened in The Troubles—the experience of violence, men on men, fathers and sons, the prominence of religion, the problem of suffering, all these things that seemed heightened in Belfast at that time. So in a way yes, the books are quite associated in my mind although they might not at first seem so. There are also the challenges that require creative resilience in people, I think that’s something the two books have in common as well. I think for me the connection is that both the music scenes of Airdrie and The Troubles are as you say the backdrop for stories about groups of friends. In This Is Memorial Device a lot of those stories are quite sad, and in For The Good Times a lot of those stories are quite violent, but the camaraderie that runs through both is quite beautiful and frankly hilarious a lot of the time. I really loved the contrast between the brutal violence and the comic in your new novel. There is an innocence about the characters in a way, and I don’t know whether this was your intention, but for me it showed something about how easy it can be for people to get into extremism, as it often starts off more as counter-culture. Yeah I do think that is a big part of it, of any armed movement or struggle, it’s kind of inevitable that it gives way to gangsterism. In a way there were such limited options for kids in that space and time that of course they were looking up to the heroes in their community. When you think about the contemporary case of terrorism by ISIS, or the attack on the Ariana Grande concert, although I cannot accept that as heroic in anyway, I was very aware that these killers are able to be held up as heroes – how is that possible? What I wanted to do with For The Good Times was to seduce you with the characters, to see that they are funny and sharp and real, and that they have their own difficulties and problems as well. At the same time, they are unrepentantly cold-blooded killers, and yet you feel emotion for them. It’s a really interesting contrast for sure. Going back to what you were saying about your background, and listening to your Dad and his friends, there’s this Irish wit and wordplay that is so prominent in For The Good Times. I’d been reading Molloy recently, and a lot of the turns of phrase really reminded me of Beckett, and of Irish modernist writers more generally. Yeah for sure, I’ve always loved Beckett and Joyce and that kind of Irish literary history. I’m a huge fan of Joyce, and actually towards the end when Sammy’s getting arrested and taken away, and he rises up over the Ardoyne, and basically urinates on the Ardoyne as this kind of Christ figure, that’s me playing a bit with a very famous image from Irish modernist literature which is the end of Joyce’s “The Dead” from Dubliners. So yeah, I was definitely consciously engaging with the Irish modernist tradition, although I wanted to make the point in a way that the modernist tradition in Ireland really stems from the Irish vernacular, the love of telling jokes, and the idea that storytelling is performative, and that there are different ways in which to perform a story. I wanted some passages to have the cadences of songs, I wanted to have stories told like interviews back and forth, and some that were pure fantasy like comic strips—this all comes from the Irish folk tradition, but also from the Irish street tradition, which I think definitely informs Irish modernism: that tremendous faith in the power of language. I mean, I mentioned the birthday and Christmas cards earlier, some of them really read like Beckett! When you’re reading revered texts like that which are 100 years old now, it’s easy to forget that about writers like Joyce sometimes. 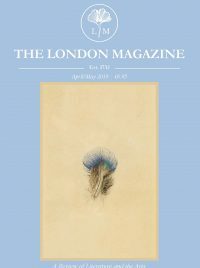 I’ve heard you speak before about the “psychic reality” of a place in relation to the mix of fictional stories and actual physical spaces, does that relate at all to your writing about tarot? I think they’re two slightly different things to be honest. I think that there are certain stories that are best told through fiction, and that fiction can be closer to reality than any kind of documentary might allow. What is the true story of The Troubles? On the one hand I wanted to have a famous incident such as the hunger strike of Bobby Sands, which was such a big image from my childhood that I could never really get out of my mind. But then, the real story of The Troubles isn’t really the death of Bobby Sands—instead it is the undocumented lives, all the terrible murders that took place, and all the families that were bereaved. How do you tell that story? Fiction gets as close to the psychic truth of it as anything else. Similarly with This Is Memorial Device—how do you tell the story of post-punk? The story of post-punk isn’t, I don’t know, Gang of Four or whatever, it’s the bands that played two gigs and then broke up, it was a really chaotic movement. But I like to base these stories in real places, because it means that magic is available to you wherever you are, in the street names and the parks, and when you name them within the fiction, it does elevate them to this level of magic. That’s why I included an index to This Is Memorial Device, I wanted it to be like a field guide that you could use to explore the psychic truth of what happened in those times, even if nothing actually did happen in those particular places. As a fan of a lot of Scottish post-punk bands, you definitely capture the feeling I get from listening to and reading about bands like Fire Engines and The Pastels. One of the big things I think about is: how do you communicate energy? I always want a book to be high energy, so that it can transport you, and communicate the experience of being there. I mean, I experienced that energy, I was going to gigs, seeing The Pastels and The Vaselines in 1987, and I remember you would come into Glasgow and there would be amazing record shops, and you would recognise people from bands on the street, and the street names would suddenly become significant, and I loved that, that everything can become significant. That’s what I was talking about when I was talking about places where reality can become up for grabs. It’s amazing how well received in other languages This Is Memorial Device has been—I’ve noticed that you’re quite a hit in the Spanish speaking world in particular! Yeah it’s mad! In Mexico in particular, I spent some time there and it was absolutely crazy, it was more like rock gigs rather than signings or readings, the energy was incredible. I’d never been to Mexico, but I spent a lot of time hanging out with great writers like Carlos Velázquez—who I immediately knew I had so much in common with, amazing energy as well—and the more I stayed there I realised that Mexico City is one of those places like Airdrie or Belfast where reality seemed up for grabs. It felt like my spiritual home when I was there. It reminded me of Belfast in that people were really friendly, but also really wild . . . you see crazy things on the street all the time there. It’s so DIY there as well, because there’s so much poverty, people are really busking it in order to try to survive. A guy tried to sell me a boiled egg outside of the shell on the street, then there’s people getting their haircut in portaloo cabins that have been turned into hairdressers, there’s noise everywhere and people everywhere. And the people in the literary scene there really are true believers, and they all love rock ‘n’ roll too. They really are true believers though—to be in a band or to be a writer or to be a publisher in Mexico City is hard won. I’ve started doing some writing about Mexico actually, I can’t wait to go back. I have to agree! I love the surrealists, and I love Nadja (Breton’s 1928 novel) and all of those guys, but he’s totally spot on, there’s so much stimulation everywhere you go! That’s a great line. My third novel is actually finished now, and then after that’s released I’m working on this book about Mexico, which I think will be more of a memoir piece about Mexico . . . so I’ll be working on that I guess. My next book though will be called Monument Maker, and it’s absolutely huge—about a quarter of a million words—so we’re just trying to figure out how we’re going to publish that at the moment. But again, it’s very different to the previous two books—it’s a long form meditation on religious art, particularly Romanesque sculpture, the great cathedrals of France, which then dissolves into the story of a stranger escaping a religious cult, which then zooms back around again and turns into a love story. Overall it’s a very obsessive investigation into religious art, spirituality, and how we express things through art. 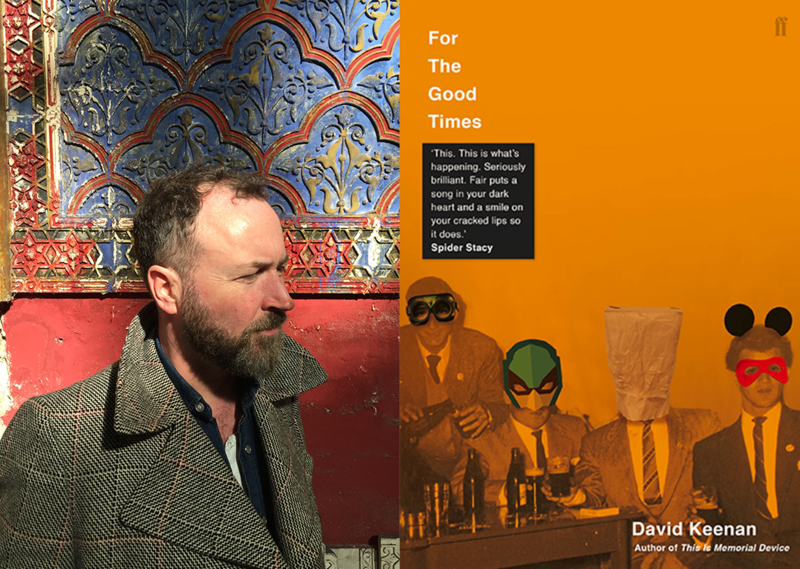 For The Good Times by David Keenan will be released on January 24th. For more information and to pre-order the book, visit Faber.